Preheat the oven to 350°F / 180°C. Lightly oil or line a 9-inch round springform pan and set aside. In a medium bowl, whisk together the flour, almond flour, baking powder and salt. Set aside. In a large bowl, add in the eggs. Using a hand beater, quickly beat the eggs to break up the yolks. Add in the sugar and beat it in thoroughly on medium speed, about 45 seconds. Add the olive oil and beat on medium speed, until the mixture is a bit lighter in color and has thickened slightly, about 45 seconds. Add in the vanilla extract, almond extract, zest and orange juice, and beat on medium speed until everything is combined, about 30 seconds. Add the dry ingredients to the bowl and beat on low speed until they are thoroughly combined and you have a smooth batter, about 45 seconds. Pour the batter into the prepared pan, and bake the cake for 30 to 40 minutes, rotating the cake pan halfway through to ensure even browning. The cake is done when the sides have begun to pull away from the sides of the pan, it springs back lightly when touched, and a toothpick inserted in the center comes out clean. Dust with powdered sugar and additional orange zest when serving. The idea of adding poppy seeds to this cake recipe came from Lottie + Doof's Poppy Seed Cake. Almond Olive Oil Cake recipe adapted from Gina DePalma. I reduced the amount of sugar, added in the poppy seeds, and made a couple other minor tweaks. 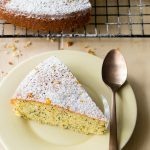 Get this recipe for Almond Olive Oil Cake with Orange and Poppy Seeds at https://www.theworktop.com/breakfast-brunch-recipes/almond-olive-oil-cake-poppy-seeds/.